Recently, I have been hitting the scholarly German articles in "translator mode" like never before. Having worked through numerous articles so far, I have noticed a few handfuls of words that continually re-appear, words that, if you want to move more quickly through the translation process, you "must know." So, I decided to create a new module which focuses on 40 words. 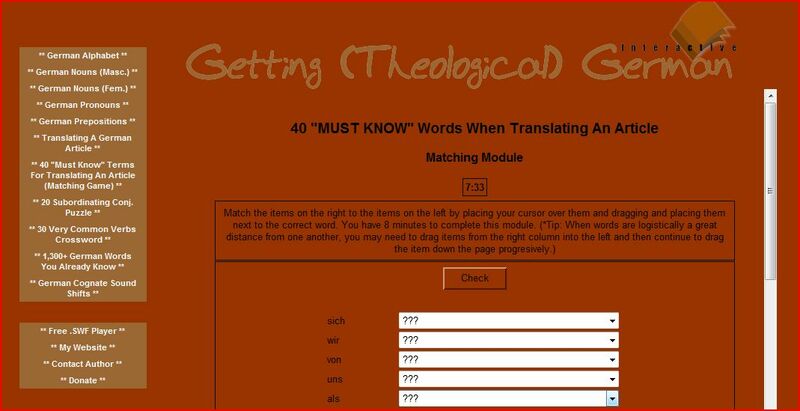 You can access this fun, challenging (timed) module for free at www.GettingGerman.com or by clicking the image below. By the way, if you have found the site helpful, why not tell your friends about it or post a note about it on your site / blog / social media network, etc.? Enjoy!